I teach a children's Bible study class on Wednesdays and last night we decided to do a project. This project required me to take a picture of each child before class began and then print the picture out. As I print and cut each picture, the children prepared the popsicle sticks, stickers, and other fun things for the project. Then I handed each child their picture. Now, boys will be boys. Most of them made some silly face or showed their muscles. However, the girls smoothed their hair and prepared their most beautiful smiles. But as each girl received her picture, I heard responses that broke my heart. Ugh, look at my hair. And the list goes on. These are children. Ages five to eleven years old. Yes, even the sweet, beautiful, not at all fat five year old complained that she looked fat in her picture. As I hear each comment I am thinking why on earth are these girls saying this? They are all so beautiful and not one is fat. Then it hit me. They hear it from us, their moms. Their aunts and grandmas. We look in the mirror and put ourselves down because of our looks. We see pictures of ourselves and complain about our weight, hair or skin. We diet, take all kinds of pills, exercise and still complain of our weight. Now, good health is important, but good health and being a size six are two completely different things. We spend endless hours on hair and makeup and spend money at salons and stores. We like to look good, of course. We want to look our best for our husband and to feel good about ourselves. But friends, what message are we sending our children? That weight is most important? That we are not pretty unless we come in this perfect little package? That we are less of a women if we don't strive for this perfection? That our daughters must work to meet society's idea of beautiful? That our sons must only marry society's idea of beautiful? Anything less is failure? Genesis 1:27 tells us that we were made in the image of God and Ephesians 2:10 tells us that we are God's handiwork. Oh my dear friend, you were made by God's own hands. He created you just the way you are. You are beautiful. You are His very own treasure. Just the way you look right this moment, God things you are beautiful. We need to find our confidence in God, not in how the world says we need to look. We need to teach our children to have confidence in who they are in God. They need to understand that they are His treasure too. That He created them and loves them. How can we teach them this truth if we don't believe it? We should teach our children to exercise for health, not size. We should teach them good hygiene and how to care for themselves. But in a way that we are taking care of the temple of God, not meeting unrealistic expectations put on by the media, which half of is fake anyway. I am not telling you to stop exercising or throw out your makeup case. But I am telling you that it is time we stop spending so much time in a gym and in front of a mirror and criticizing our self and time to start spending more time in the Word of God. When your inside is beautiful and lovely, that beauty radiates to the outside. I can see a woman who may not be the most attractive woman according to the world's standards, but she is absolutely beautiful because of the Spirit inside of her. By the same token I can see a woman who is perfect by the world's standards but has an ugly spirit about her. Which kind of beauty do we really want? 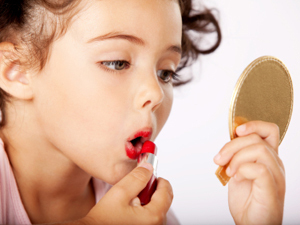 Which kind of beauty is most important for our children to understand? See yourself as God sees you. Have confidence in who you are in Him. Know that you are beautiful, loved and treasured by the One who made you. So very true... health and fitness are important together with balance with spiritual and emotional understanding of inner beauty and confidence in Christ! :) great post! EXCELLENT and unfortunately it's not just us - it's the MEDIA - Magazines, TV, SELL an idea of beauty and it is NOT realistic and we adults have bought into it and the kids sit in front of a tele that is selling it. Just look at Barbie - In real life she would look totally deformed! Bless You! This post made me cry...because I saw myself in it. And, unfortunately, I see my daughters & granddaughters doing the same thing. I am so tired of hearing my daughters...my BEAUTIFUL daughters saying they are fat or ugly or whatever...it makes my heart hurt that they can't see their beauty. This must be how my mama felt as I did the same thing...and still do. YES!!! You are absolutely right, Jenifer. How sad that our children have heard our complaining and are echoing it. I'm sure I did the same thing and I heard my daughter said it as a ten year old and when visiting her this summer, lo and behold I heard her eight year old daughter say it!!! I told Beth that she was beautiful because she had God's spirit within her and that is what made her attractive! I pray that moms will read this and take heed! Have a good day and keep up the great writing. This is a lovely post! It is exactly what my work is all about. I spoke in this exact topic recently at The School for the Well Spoken Woman in NYC. How we see and care for ourselves is how our girls will see and care for themselves. All of us can be shining light examples for all little girls. There is so much beauty in each of us. Really great post and a reminder to take care what we are teaching our children with our OWN actions. Love you're article :)!! Amen!! Love you're article :) Amen to it! Great post, Jenifer! Kids get such warped view of their bodies. 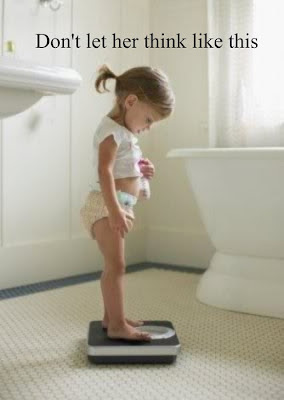 I was watching my weight when I was 9 years old struggled with an eating disorder through high school. We believe the lies. It's so important for parents to impress on their kids the truth.